Starting your own business is a marathon of facing tough decisions. 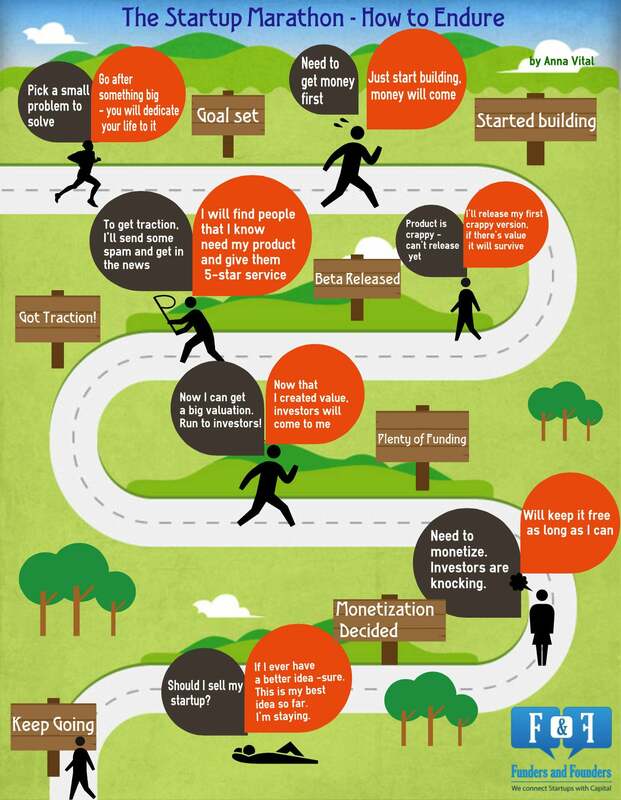 If you are thinking about starting your own business, you need to have the stamina of a marathon runner. And once you start your career as an entrepreneur, a glass-half-full attitude will serve you well as you face a continuous stream of problems to solve and questions to answer. Check out this infographic (below) from the startup organization Funders and Founders, which depicts some of the conflicting thoughts an entrepreneur can struggle with. From coming up with an idea to cashing out, you may face dilemmas where you will be pulled in at least two directions. Successful entrepreneurs learn that to grow, you have to be able to make a decision one way or another, often with no absolute right or wrong answer. Just keep going. While 40 percent of startup business owners expect the economy to weaken in the next year, a vast majority think their own business will succeed, according to a survey from entrepreneurship organization Kauffman Foundation and online document resource LegalZoom this week. Nearly four of five entrepreneurs that started businesses in the past year think that their business will be more profitable in the next year than they are today, the survey found. What do you think is the most critical character trait of an entrepreneur? Leave a comment below and let us know.